he title page (to the right) says it all: »Erbaulicher Sterb-Spiegel / Das ist: Sonnen-klahre Vorstellung Menschlicher Nichtigkeit / Durch alle Stände und Geschlechter: Vermittelst schöner Kupffern / Lehr-reicher Bey-Schrifften und Hertz-beweglich angehängter Todten-Lieder. Ehmahls herauss gegeben Durch Rudolph und Conrad Meyern / Mahlern in Zürch. Anjetzo aber mit Lateinischen Unter-Schrifften der Kupffer vermehret und aussgezieret / von dem Welt-berühmten Poëten Augustino Casimiro Redelio, Belg. Mech. Sac. Cæs. Majest. L. P. Augspurg / Zu finden bey Johann Philipp Steudner. Druckts / Abraham Gugger / 1704«. 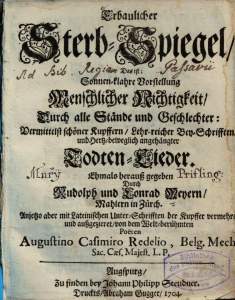 The book is a copy of Sterbensspiegel, which was published by Rudolph and Conrad Meyer in 1650. In this copy the quatrains under each plate have been replaced by a Latin text by August Casimir Redel (1656 - 1710) from the Belgian city of Mechelen. The book was printed in Augsburg in 1704. 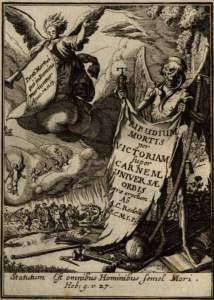 In 1704 copies of 52 of these etchings were published at Augsburg, under the title of "Tripudium mortis per victoriam super carnem universæ orbis terræ erectum. Ab A. C. Redelio S. C. M. T. P." on a label held by Death as before. 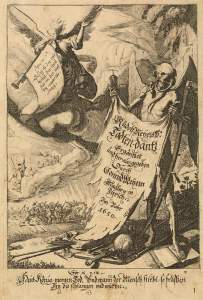 Then the German title "Erbaulicher Sterb-Spiegel dast ist sonnen-klahre vorstellung menschlicher nichtigkeit durch alle stande und geschlechter: vermittelst schoner kupffern, lehr-reicher bey-schrifften und hertz-beweglich angehangter Todten-lieder ehmahls herauss gegeben durch Rudolph und Conrad Meyern mahlern in Zurch Anjetzo aber mit Lateinischen unterschrifften der kupffer vermehret und aussgezieret von dem Welt-beruhmten Poeten Augustino Casimiro Redelio, Belg. Mech. Sac. Cæs. Majest. L. P. Augsburg zu finden bey Johann Philipp Steudner. Druckts, Abraham Gugger. 1704." 4to. That is, "An edifying mirror of mortality, representing the nullity of man through all stations and generations, by means of beautiful engravings in copper, instructive inscriptions, and heart-moving lays of Death, as an appendix to the work formerly edited by Rudolph and Conrad Meyern of Zurich, but now published with Latin inscriptions, and engravings augmented and renewed by the worldly renowned poet Augustin Casimir Redel, &c."
In this edition the Pope and all the other religious characters are omitted, probably by design. The etchings are very inferior to the fine originals, and without the name of the artist. The dresses are frequently modernised in the fashion of the time, and other variations are occasionally introduced. As Douce points out, the clergy are missing. Sterbensspiegel from 1650 was organized into three groups or "crowds" that each were introduced by an unnumbered plate: The ecclesiasticals, the regents and the lower classes. Erbaulicher Sterb-Spiegel follows the same structure and it does in fact have a plate of Die sambtliche Geistlichkeit (the entire clergy), but the plate is not followed by any clergy, as the next plate is Der Regier-Stand, which in turn is followed by emperor, empress, etc. The image of the soldier is also lacking because it's the same plate as the the highway robber with the same Latin verse with the heading »Latro«. The copies are not bad, but in contrast the paper is, so it can be hard to see the scenes, when the print on the other side is bleeding through. Erbaulicher Sterb-Spiegel is a copy of Sterbensspiegel. Many of Meyer's scenes, e.g. 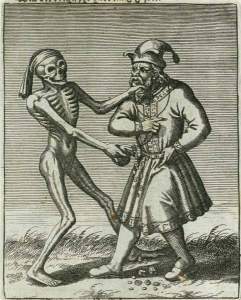 the Jew, were copied from Basel's dance of death.